Terry Gilliam has carved out a place for himself as one of cinema’s most striking and original fantasists. As the director’s new film The Man who Killed Don Quixote arrives in Australian cinemas, Travis Johnson revisits five of Gilliam’s bona fide masterpieces. It’s taken over 25 years and an endless cavalcade of setbacks that would drive a lesser man to drink, drugs, destitution, or all of the above. 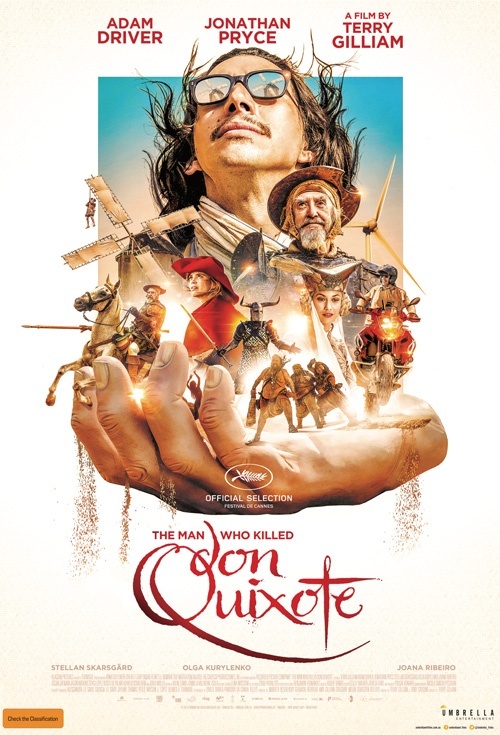 But at long last Terry Gilliam’s opus, The Man who Killed Don Quixote, is getting a wide release in Australian cinemas. Huzzah! As fans of Gilliam know, the former Monty Python mainstay is no stranger to adversity. As chronicled in his must-read autobiography, Gilliamesque, his filmmaking career been dogged by disaster every step of the way, from the early low-budget mishaps making Monty Python and the Holy Grail with co-director Terry Jones, to the titanic struggle with Universal head Sid Sheinberg over the fate of the dystopian Brazil. Despite it all, Gilliam has consistently produced film after breathtaking film, carving out a place for himself as one of the cinema’s most striking and original fantasists. Out of the modern pantheon, only Guillermo del Toro is comparable, and the Mexican maestro’s debt to old Terry has been repeatedly noted by himself and others. Gilliam’s vision is unique: his probing cameras, baroque style, cartoonish characters, and jam-packed, incredibly detailed mise en scene are instantly identifiable, as are his repeated themes of history, fantasy, humanity, and the solace of insanity. Just delve into these five masterworks for a taste of the divine madness that only Gilliam can craft. Gilliam’s second film as solo director following 1977’s Jabberwocky, Time Bandits sees a young English boy, Kevin (Craig Warnock) pinballing across time and space in the company of the bedraggled titular outlaws – dwarfish former employees of the Supreme Being who have nicked a map of temporal wormholes and plan on getting rich by pillaging all of history. Chaos ensues – as it is wont to do in Terry Gilliam productions. 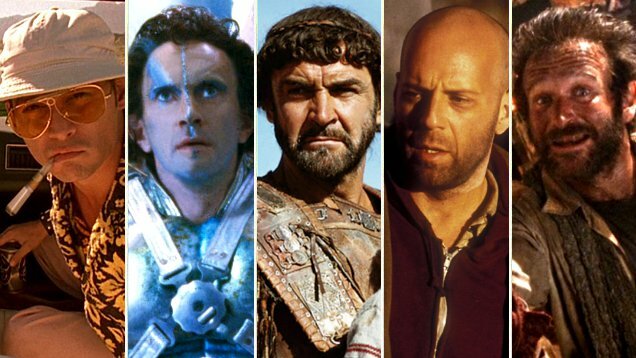 With David Rappaport, Jack Purvis, and Kenny “R2-D2” Baker comprising the core bandits, cameos from John Cleese as Robin Hood, Ian Holm as Napoleon, and Sean Connery as Agamemnon, and a gleefully ramshackle plot that never lets logic get in the way of a striking image, Time Bandits is an unfettered flight of Gilliam fancy. It may lack the discipline of his later films, but as a work of pure, fantastical id, it’s unparalleled. Famously re-edited over Gilliam’s protests, as first released the dystopian satire was saddled with an abrupt and rather nonsensical happy ending. Luckily, more sober minds prevailed, and Brazil is now widely available in all its bleakly hilarious, unexpurgated glory. Set in surreal, quintessentially British totalitarian metropolis, Brazil blends the competing influences of George Orwell and Federico Fellini (one of its working titles was ‘1984 and ½’) to tell the story of lowly everyman Sam Lowry (Jonathan Pryce), who only wants to live a quiet, unambitious life. Unfortunately for him, he is caught up in the terrible machinations of the state when a clerical error brings in contact with both the girl of his dreams (Kim Greist) and a rogue heating engineer/possible terrorist (Robert de Niro). His world is quickly and horribly turned upside down. A merciless satire of bureaucracy and authoritarianism and a celebration of the human spirit, Brazil stands as the high point of Gilliam’s storied career, and an encapsulation of the themes he has pursued his entire life. Gilliam brings Camelot to Manhattan in this humanist romantic fantasy that sees fallen radio shock jock Jack Lucas (a perfect Jeff Bridges) seek redemption by helping an insane homeless man, Parry (Robin Williams, never better) win the heart of Lydia (Amanda Plummer) the girl of his dreams. Unfortunately, Parry thinks he’s a knight charged with finding the Holy Grail, which complicates things somewhat. Gilliam returns to the Arthurian themes of Monty Python and the Holy Grail with this lyrical urban fable about guilt, grief, love and forgiveness. The Fisher King is easily Gilliam’s most emotionally mature film, putting his rich and evocative visuals and deep mythological themes into the service of a genuinely touching human story. A horribly fixed future awaits us in this apocalyptic time travel tale, in which Bruce Willis’s future criminal, James Cole, is sent back in time to the current day in order to unravel the source of a deadly virus that will wipe out most of humanity and render the surface of the planet uninhabitable. To psychologist Kathryn Railly (Madeleine Stowe), he seems to be just another schizophrenic – or are the pressures of time travel simply too much for the human mind? What does it have to do with wealthy heir, asylum inmate, and occasional activist, Jeffrey Goines (Brad Pitt)? And who or what are the Army of the 12 Monkeys? Inspired by Chris Marker’s experimental 1962 film, La Jetée, 12 Monkeys is a twisty and occasionally frustratingly oblique affair thanks to a dexterous script from David and Janet Peoples. These days, it’s a curious artefact out of time itself: a reminder of a time when studios would give large sums of money to former animators so they could cast A list stars in convoluted thinkpieces that would go on to earn big money at the box office. It was a golden age. Gilliam dreams more darkly in this long-gestating adaptation of gonzo journalist Hunter S. Thompson’s cult 1971 novel. Buy the ticket, take the ride, and see Johnny Depp as Thompson’s drug-crazed alter ego Raoul Duke and a bloated Benicio del Toro as his attorney, Dr. Gonzo. They hare across the desert to the titular city – ostensibly to cover a an off-road motorcycle race, but in (altered) reality to consume as much narcotics as they can and let their freak flag fly. As befitting its source material, Fear and Loathing is a fascinatingly ugly and grotesque experience, packed with gurning freaks, scandalised normies, horrifying hallucinations, sour observations of humanity, and a whole galaxy of uppers, downers, screamers, laughers… you get the picture. Depp’s performance as Duke/Thompson is pure mimicry: a spot on impersonation rather than a recreation. But in the garish world created by Gilliam he’s just another freak in the freak kingdom – and that’s how it should be.